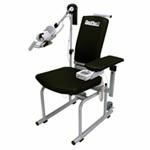 Optiflex CPM machines include shoulder devices and devices that are designed to work with the knees and even trolley systems. The controllers are also available for these devices in this section. Optifliex CPM machines are high quality, professional grade equipment.